This is a list of named geological features on Europa, a moon of the planet Jupiter. Craters and lineae are listed on separate pages: list of craters on Europa and list of lineae on Europa. The information is provided as of 2015. On Europa, regions of chaotic terrain are named after places in Celtic mythology. These impact structures are named after important locations in ancient history. Europan maculae (dark spots) are named after locations in Greek mythology, especially in the legend of Cadmus and his search for his sister, Europa. 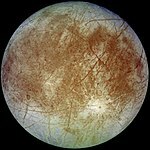 Wikimedia Commons has media related to Maps of Europa. This page was last edited on 9 December 2018, at 01:13 (UTC).